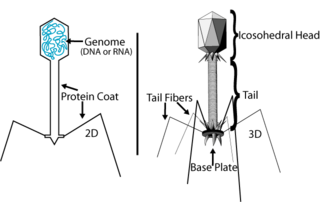 A bacteriophage (from "bacteria" and Greek phagein, "to eat") is a virus that infects bacteria. The term is commonly used in its shortened form, phage. Like viruses that infect eukaryotes (plants, animals, and fungi), phages vary greatly in structure and function. Typically, they consist of an outer protein hull, or capsid, enclosing genetic material. The genetic material can be either RNA, but is usually double-stranded DNA. The phage genome varies in size from between 2 to 200 kilo base pairs per strand of nucleic acid (Baron 1996). As harmful as many viruses are for the human body, the specificity of phages offer some promise as potential agents to destroy disease-causing bacteria (known as phage therapy). Phages are ubiquitous and can be found in many reservoirs populated by bacteria, such as soil or animal intestines. One of the densest natural sources for phages and other viruses is sea water, where up to 109 virions, or complete virus particles, per milliliter have been found at the surface. Up to 70 percent of marine bacteria may be infected by phages (Prescott 1993). 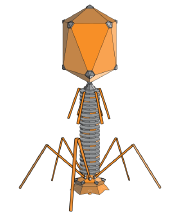 The classic structure of a bacteriophage is shown on the diagram to the right, which features complex symmetry. The head of the structure, which contains the genetic material, features icosahedral symmetry, whereas the tail features helical symmetry. A hexagonal base plate has multiple tail fibers projecting off of it. In reality, this structure is present mainly in the T-even and coliphages. Other complex bacteriophages may lack tail fibers or may even possess contractile tails. Various other phage morphologies have been observed, such as the long, filamentous Inoviridae family, rod-like structures, or the spherical Cystoviridae family. Bacteriophages can reproduce only within a host cell and may have a lytic cycle or a lysogenic cycle. Few viruses are capable of carrying out both cycles. In the lytic cycle—characteristic of virulent phages such as the T4 phage—during the last stage of infection, the host cells break open, or lyse, and die after the virion replicates. Once the cell is destroyed, the viruses have to find new hosts. In contrast, the lysogenic cycle does not kill the host cell. The phage genome is inserted into the bacterium's chromosome and, during cell division, the integrated phage genome replicates along with the host chromosome. Thus, the lysogenic cycle allows the host cell to survive and reproduce, and the virus is reproduced in all of the cell’s offspring. Phages able to undergo both a lytic cycle and a lysogenic cycle, such as the lambda phage, are known as temperate phages. For example, the lambda phage DNA integrates with a bacterium's chromosomal DNA and replicates along with it. Once the phage genome is part of the bacterium's chromosome, it is called a prophage. (If the phage genome is not incorporated into the host chromosome, but remains separate, it is called a plasmid.) The virus remains dormant, being replicated along with the host DNA and passed on to daughter cells until the host cell is damaged, perhaps due to radiation or the presence of certain chemicals. Then the prophage exits the host chromosome in a process called prophage induction. After induction, the phage initiates viral reproduction via the lytic cycle, which results in the death of the host cell. Sometimes expression of prophage genes can alter the phenotype of the host bacteria. In some cases, this phenomenon, called lysogenic conversion, has medical significance for humans. For example, the bacteria that causes diptheria, Corynebacterium diphtheriae, is harmless to humans unless it is infected by the phage β. Then the prophage genes induce the host bacteria to produce toxins. To enter a host cell, bacteriophages attach to specific receptors on the surface of bacteria, including lipopolysaccharides, teichoic acids, proteins, or even flagella. This "lock-and-key" specificity means that a bacteriophage can only infect certain bacteria bearing receptors that they can bind to. As phage virions do not move actively, they must rely on random encounters with the right receptors when in solution, such as blood or sea water. Complex bacteriophages, such as the T-even phages—T2, T4, and T6—are thought to use a syringe-like motion to inject their genetic material into the cell. After making contact with the appropriate receptor, the tail fibers bring the base plate closer to the surface of the cell. Once attached completely, conformational changes cause the tail to contract, possibly with the help of ATP present in the tail (Prescott 1993). The genetic material may be pushed through the cell membrane, or it may be deposited on the surface. Other bacteriophages may use different methods to insert their genetic material. The empty capsid of the phage is left outside the host cell as a "ghost," empty of genetic material. Within a short amount of time, sometimes just minutes, bacterial polymerase starts translating viral mRNA into protein. For RNA-based phages, RNA replicase is synthesised early in the process. Early proteins and a few proteins that were present in the virion may modify the bacterial RNA polymerase so that it preferentially transcribes viral mRNA. The host’s normal synthesis of proteins and nucleic acids is disrupted, and it is forced to manufacture viral products. These products go on to become part of new virions within the cell, proteins which help assemble the new virions, or proteins involved in cell lysis. In the case of the T4 phage, the construction of new virus particles is a complex process that requires the assistance of special helper molecules. The base plate is assembled first, with the tail being built upon it afterwards. The head capsid, constructed separately, will spontaneously assemble with the tail. The DNA is packed efficiently within the head in a manner that is not yet known. The whole process takes about 15 minutes. Phages may be released via cell lysis or by host cell secretion. In the case of the T4 phage, just over 20 minutes after injection, 250 to 300 phages will be released when the cell bursts. Lysis is achieved by an enzyme called lysozyme, which attacks and breaks down the cell membrane. Some phages, however, may develop a symbiotic relationship where the host cell continually secretes new virus particles. The new virions bud off the plasma membrane, taking a portion of it with them to become enveloped viruses possessing a viral envelope. All released virions are capable of infecting a new bacterium. Phages were tried as anti-bacterial agents after their discovery. However, antibiotics, upon their discovery, proved to be more practical. Research on phage therapy was largely discontinued, but phage therapy has been used since the 1940s in the former Soviet Union as an alternative to antibiotics for treating bacterial infections. The evolution of bacterial strains through natural selection that are resistant to multiple drugs has led some medical researchers to re-evaluate phages as alternatives to the use of antibiotics. Unlike antibiotics, phages adapt along with the bacteria, as they have done for millions of years, so a sustained resistance is unlikely. Additionally, when an effective phage has been found, it will continue to kill bacteria of that type until they are all gone from the body. A specific type of phage often infects only one specific type of bacterium (ranging from several species, to only certain subtypes within a species), so one has to make sure to identify the correct type of bacteria, which takes about 24 hours. Sometimes mixes of several strains of phage are used to create a broader spectrum cure. An added advantage is that no other bacteria are attacked, making it work similarly to a narrow spectrum antibiotic. However, this is a disadvantage concerning infections with several different types of bacteria, which is often the case. Another problem with bacteriophages is that they are attacked by the body's immune system. Phages work best when in direct contact with the infection, so they are best applied directly to an open wound. This is rarely applicable in the current clinical setting where infections occur systemically. Despite individual success in the former USSR where other therapies had failed, many researchers studying infectious diseases question whether phage therapy will achieve any medical relevance. There have been no large clinical trials to test the efficacy of phage therapy yet, but research continues because of the rise of antibiotic resistance. Baron, S. 1996. Medical Microbiology, 4th ed. Galveston, T.X. : University of Texas Medical Branch. Brown, T. A. 2002. Genomes. New York: Garland Science. Häusler, T. 2006. Viruses vs. Superbugs. New York: Macmillan. Prescott, L. M., J. P. Harley, and D. A. Klein. 1993. Microbiology, 2nd ed. New York: William C Brown Pub.